On October 19, 2016, our beloved Camas Soo Bahk Do founder, Robert M.Shipley III, passed away surrounded by his wife and family. He is now on to a new adventure, most likely practicing with other great Soo Bahk Do members who have left this world. His vast interests include: Soo Bahk Do, Kendo, Sumo, auto racing, surfing, motorcycle racing, cars, airplanes, flying, history and culture, cars, world travel, languages (he spoke 6 languages), classical music, flamenco, opera, gems and gemology, and cars to name a few. On July 29, 2017, at the annual Region 10 Summer Camp, Kwan Jang Nim H.C. Hwang presented the Shipley family with the posthumous Lifetime Achievement Award in recognition of Robert M. Shipley’s contributions to the Soo Bahk Do Moo Duk Kwan. He will be greatly missed by everyone who had the honor to meet him and know him. Mr. Shipley III founded Camas Soo Bahk Do in November 1990 in Camas, WA. Over 50 years of teaching and training experience has brought him to his current rank. In 2010, he was promoted by Kwan Jang Nim H.C. Hwang to Pahl Dan (8th Level) during the Switzerland Summer Camp. Master Shipley trained with Sa Bom Nim Song-Ki Kim (Dan #327) in Korea while serving in the U.S. Air Force. Additional military training at Yale University included East Asian language and history. 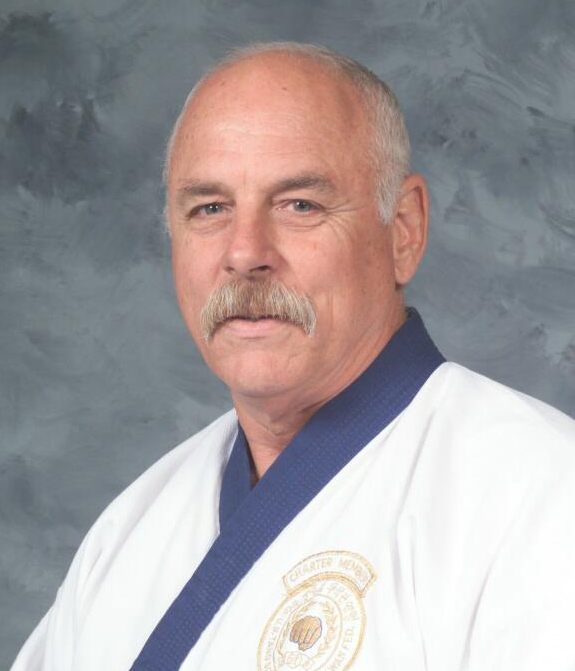 As co-founder and Charter Member of the U.S. Soo Bahk Do Moo Duk Kwan Federation, Master Shipley helps guide the continuation of “traditional” martial arts in the United States. Master Shipley has also had a varied competitive career both in Soo Bahk Do and in other martial arts in which he holds senior rank. Sa Bom Nim Shipley was born in Dayton Ohio on October 18, 1941 and raised in California – his early years in Southern Cal and later in Northern California (Cloverdale, Healdsburg). His grand-father is the founder of the Gemological Institute of America, Inc. He began his Tang Soo Do/Soo Bahk Do career in the Republic of Korea inthe fall of 1960 while stationed with the Air Force at Osan Airbase. His instructor was Master Kim, Sung Gi – Dan Bon 327 and he trained on the military base and at the dojang off base sometimes as many as 6 days a week and up to twice a day when time permitted. Sa Bom Nim Shipley was awarded a Certificate of Appreciation by Kwan Jang Nim Hwang Kee in the spring of 1962 and was awarded his Cho Dan in October, 1962. In 1963 he was married to Han, Kyong Ok, promoted to 2nd Dan and celebrated the birth of his first child – Robert (IV). In 1971, he formed Hawaii Tang Soo Do, started practicing Sumo. In 1973 he was awarded his 4th Dan and Sa Bom during a personal visit from the Kwan Jang Nim. He was awarded his 5th Dan in 1992 and his 6th Dan in 1996. In 2003, he was promoted to 7th Dan. The 70’s were a very active time for Sa Bom Nim Shipley as he was actively competing in tournaments in Tang Soo Do, Kendo, and Sumo. He was also invited by the Kwan Jang Nim to attend the early planning meetings organizing the U.S. Tang Soo Do Moo Duk Kwan Federation. He was appointed to the Board of Directors of the Federation by Kwan Jang Nim. He was also elected to the Board of Directors of the Hawaii Martial Arts Assoc. in 1976. Sa Bom Nim Shipley moved to the Portland Oregon area in 1987 to further his career in the airline industry and opened Camas Karate in Camas Washington in November of 1990. He ran the studio with his sons, Robert Shipley IV Sa Bom (Sa Dan) and Nate Shipley (Cho Dan). In 2001, he turned Camas Karate over to his sons when he moved in Rome, Italy with his wife, HeaShin Kim. Ms. Kim became the Head of the Charter/Operations Unit with the World Food Programme (WFP). While there, he continued his Soo Bahk Do training with the Italian & Swiss studios. Kwan Jang Nim appointed Shipley Sa Bom Nim as the European designee. They lived in Rome up to the time of his passing. In 2005, Kwan Jang Nim appointed him as a Hu Kyun In member – to preserve and perpetuate the History and Tradition of Soo Bahk Do Moo Duk Kwan, sharing this knowledge and experience with the Members and with the greater community. He was one of several appointed to be the “Guardians of the Art”. Sa Bom Nim Shipley’s knowledge of Korean language, culture and history have enabled him to make unique and valuable contributions to our art and organization. He was very active in the Moo Duk Kwan teaching seminars at various national and international Soo Bahk Do events. Sa Bom Nim Shipley was forever grateful and inspired by Kwan Jang Nim Hwang Kee for his vision to found the Moo Duk Kwan, his dedication and Yong Gi to persevere when times were difficult, and most of all for his steadfast example as a Moo Do model who has made many sacrifices for the sake of justice, honor, and our Moo Duk Kwan family.